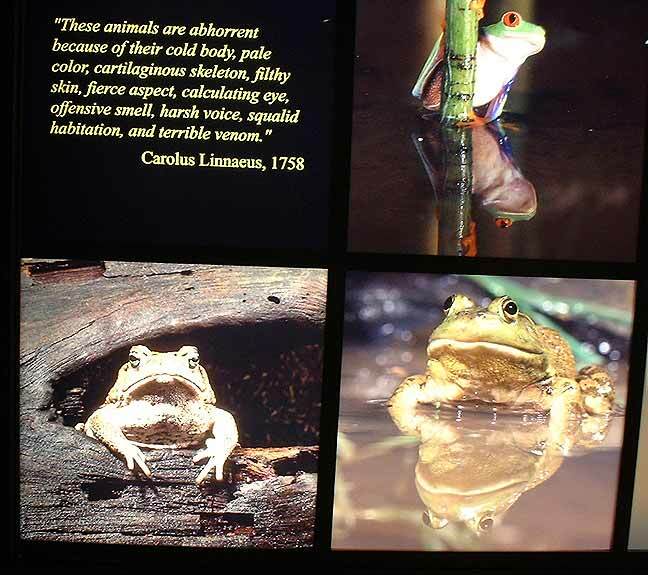 Last November, I went to visit the Museum of Natural History in Manhattan so I could see and review the Frog Show for toadilytoads.com. 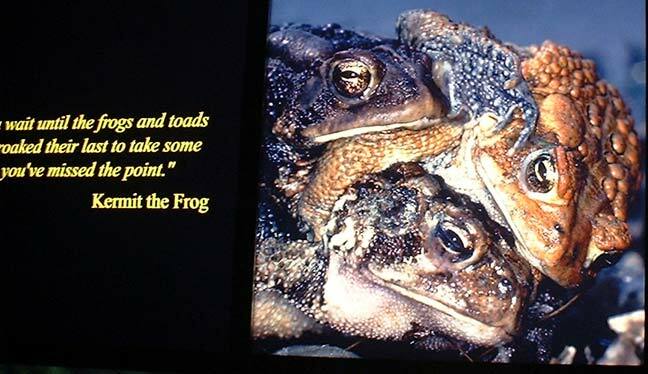 As expected, the show was low on toads and 99% of the exhibits featured frogs. The only true toads present were a few Smooth Sided Toads (bufo guttatus). However, I do love frogs, too, and it was nice to see a good sized pacman frog and a few pyxies who were fairly well along, though by no means fully grown. A note about the museum itself: The museum is very large. The Frog Show isn't all that large compared to the relative space of the museum, but the problem was, to rent a wheelchair from them, you have to travel all the way across the museum from where we entered. If you ever plan to visit this museum and need a wheelchair, check the website for their layout map. If I'd have known, we would have entered the side nearest the wheelchairs. Of course, I'd really have liked it more if I would have been able to bring my scooter, but I didn't have it at the time. The wheelchair made the day possible, however. Not only did I see the frog show but we looked around other parts of the museum as well. I even had a chance to see a photography exhibit done by the Master who is Abbot of the Zen Mountain Monastery where I sometimes visit, John Daido Loori Roshi. This was the main attraction of the show (at least as far as the show coordinators thought). 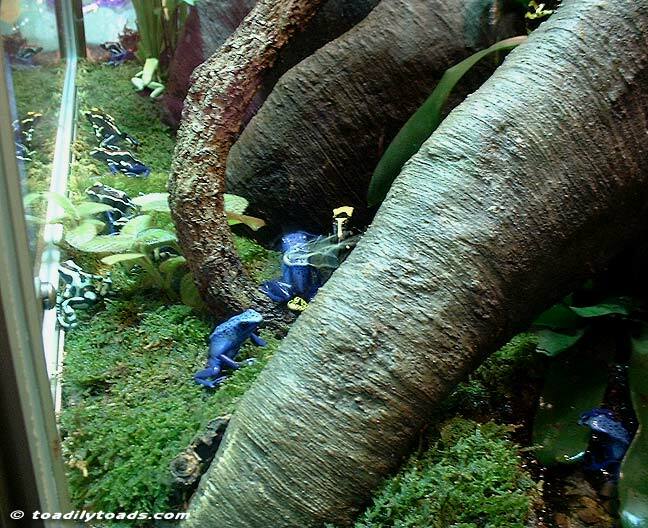 These are all poison dart frogs. I think they're all very beautiful and they have cute faces. They are fun to watch, too. Their care is not as easy as toad care, though and you really wouldn't be able to take them out and expect to have them sit calmly, eating from yourhand and enjoying a back stroke like a toad might. Still, they are very exotic and very cute and it was nice to see them in such a beautiful enclosure. This little one actually looked white in real life. I guess the camera just couldn't get the color just right. I love the little blue one hiding under the leaf, too. 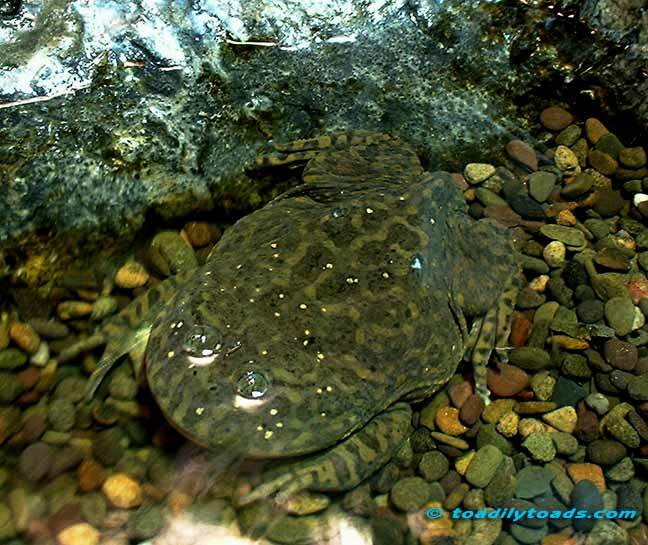 This is a Budgett's Frog. They're sort of a cross between a pacman frog and an African Claw. They are very funny to watch. 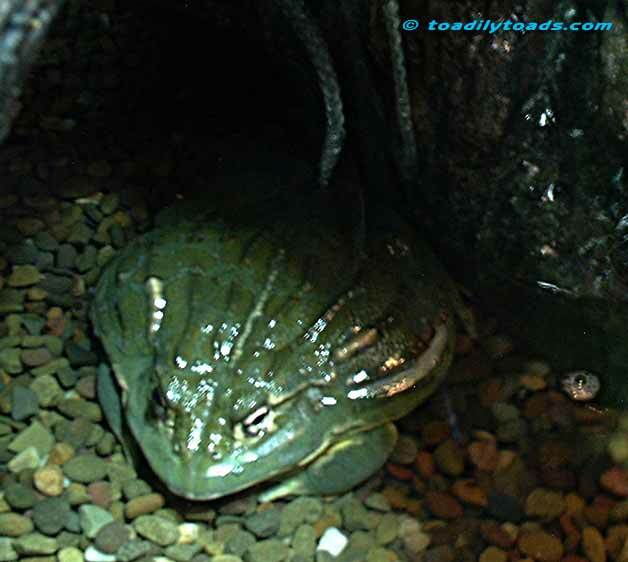 Here is a growing African Bullfrog or Pyxie frog. This frog has more growing to do but it's larger than our Pyxie. Click here for our Pyxie's gallery. Too bad this adorable toad huddle wasn't really part of the show. This was a photo that was backlit on a large wall display. It appears to be a bufo americanus female with two males on her back (the lighter one seems to be in amplexus with her and the darker one is trying to be). I could be wrong, but judging by the gland size and other features, they do look like b. americanus. The quote by Kermit got cut off and I didn't realize how much of it was missing until I got home. Too bad. It was a good quote and if I find it online someplace, I will post it here. I'm not sure who this adorable guy is, but man I would love to keep on of these. He's SO cute! I love the mouth. I cannot recall the exact name of this treefrog, but it was so cute. It's about the size of an Australian Dumpy (or White's Treefrog). Don't ask me how any of the frogs in this show were able to sleep with lights blaring at them and people staring and little children tapping on the glass. Here in the middle of the moss pile is a firebelly. 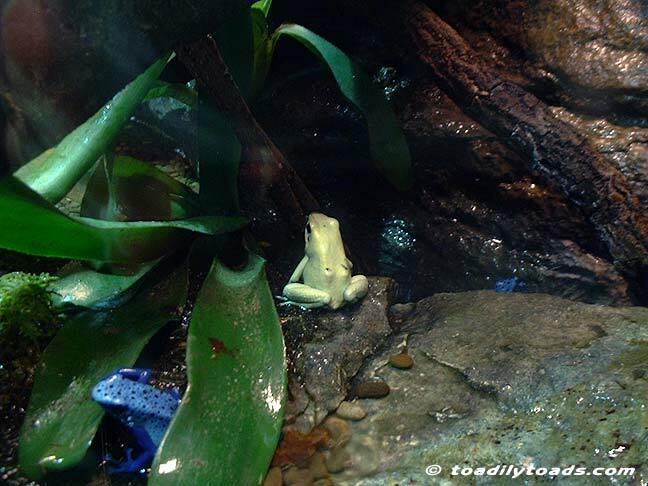 These guys are aquatic and sometiems called Firebelly toads, however, they are not toads. 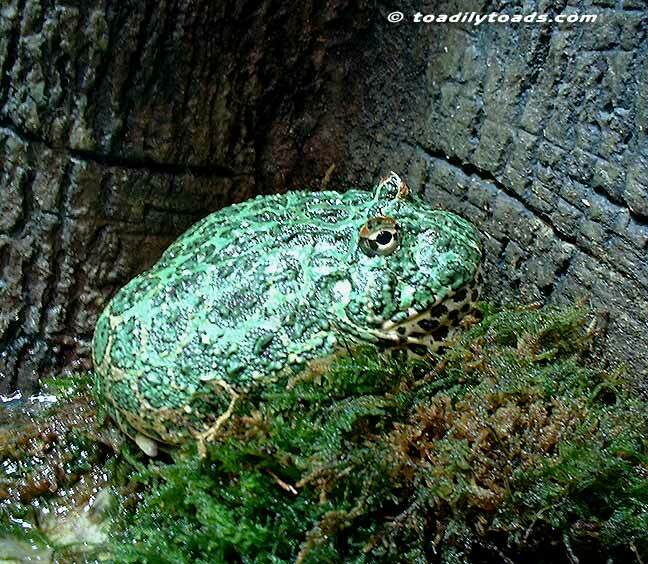 Bombina Orientalis are not Bufos at all. In fact, even stretching into the outer rim of the Bufonidae family, bombina isn't included. They are frogs. They are very cute and very frog. 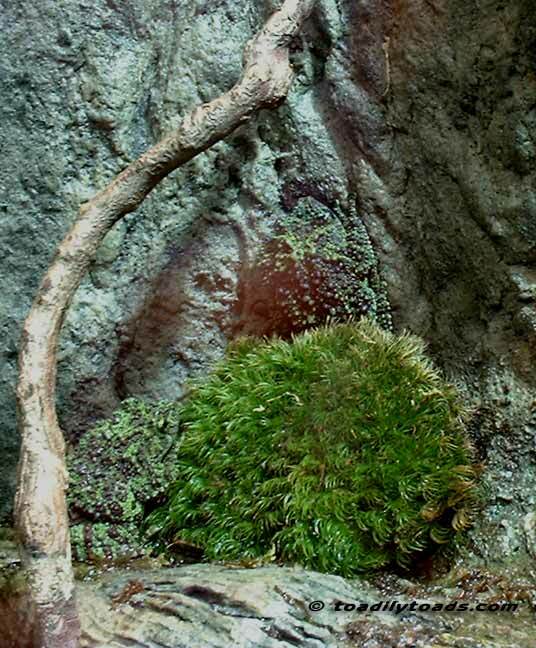 Can you spot the frog hidden in this picture? It's a Vietnamese Moss Frog. clever disguise. There were several in this tank and you had to hunt for them all. 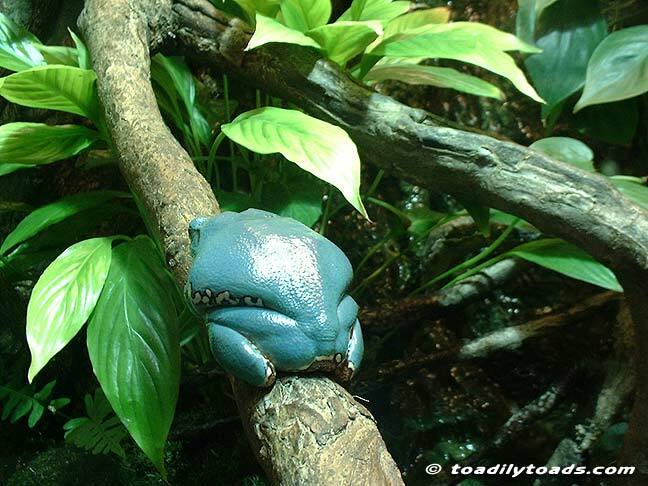 I could be wrong, but I beleive this frog was called a Mexican Dumpy. 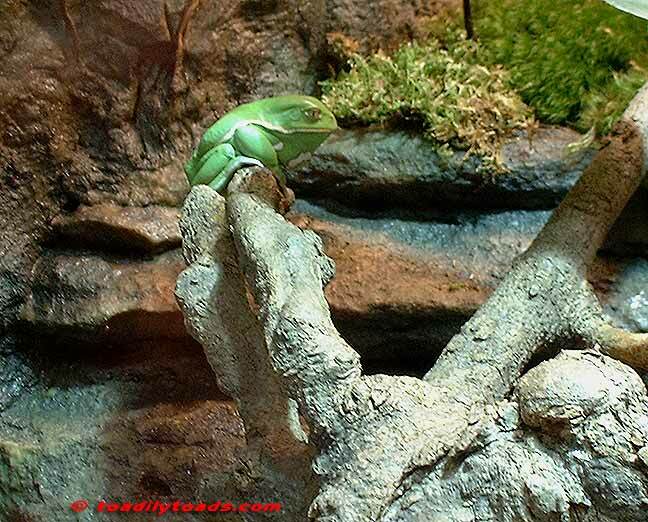 Like the other large treefrog shown above, it rivals any of the large Australian treefrogs. What a cute froggie! AWWW! He looks depressed, poor guy. 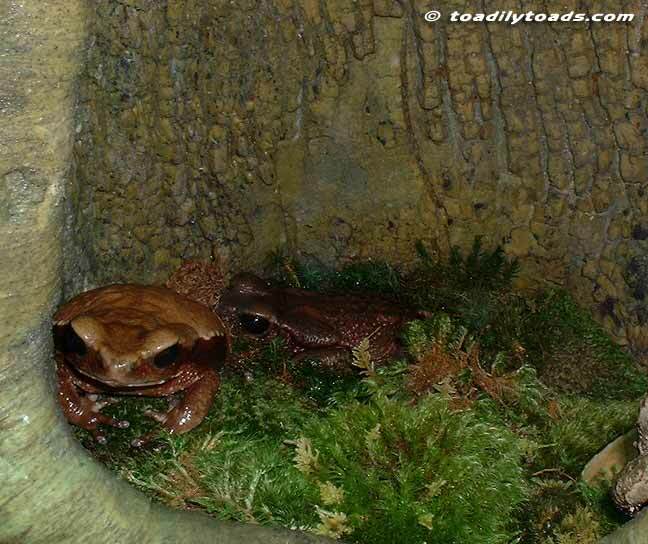 And here they are; the only true toads in the exibit. These Smooth Sided Toads, (bufo gluttatis) are very large. 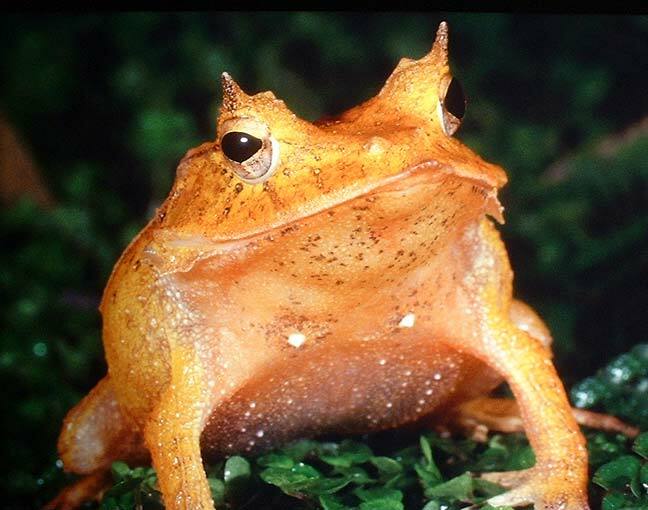 They look similar in many ways to a Rococo toad, particularly in how flat they are and how large their glands are. They were sleeping in this hollow area of a tree. It was dark in their but my flash lit them up. 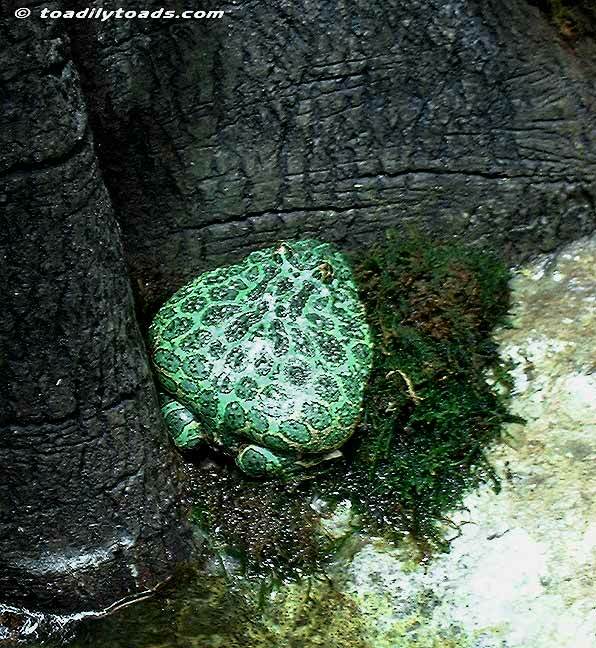 Like most toads, they are nocturnal and were trying to rest. This was another of those backlit wall displays. The quote is very frightening. First off, the toad looks absolutely intelligent. He looks like he is about to narrate a PBS documentary on some nature show or read Hamlet aloud. (Ok, here's where I show real toad bias), notice the dumb, though very cute expression on the bullfrog's face. 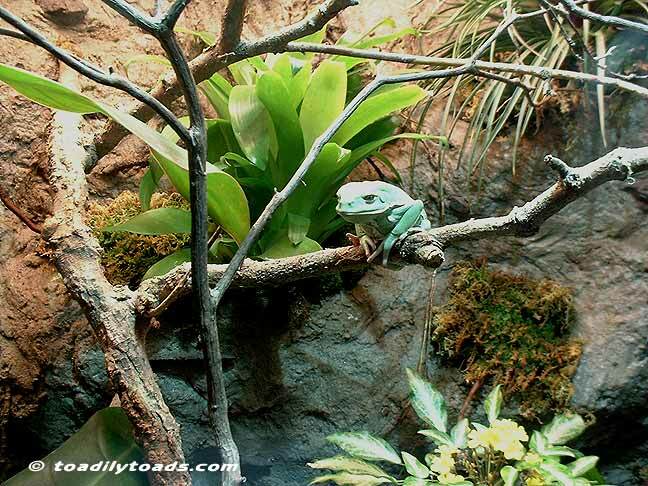 He sure is adorable, but he doesn't look like he will be reading Shakespeare with our toad friend! 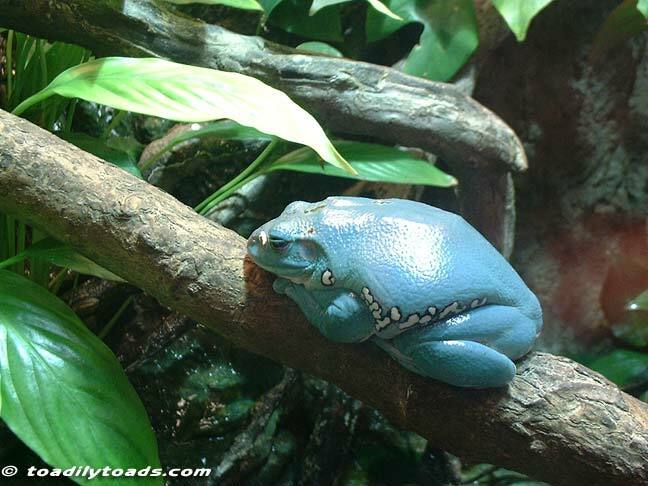 Here is a fine looking pacman frog. I really liked the way they had the terrarium set up. 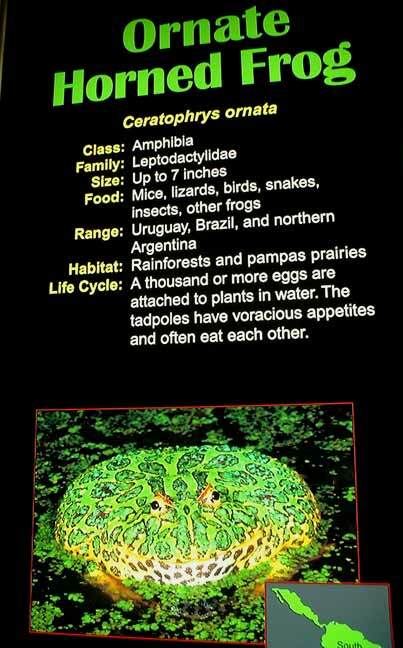 My husband and I do not keep "frog moss" in our pacmans' tanks because of the amount they ingest when feeding. 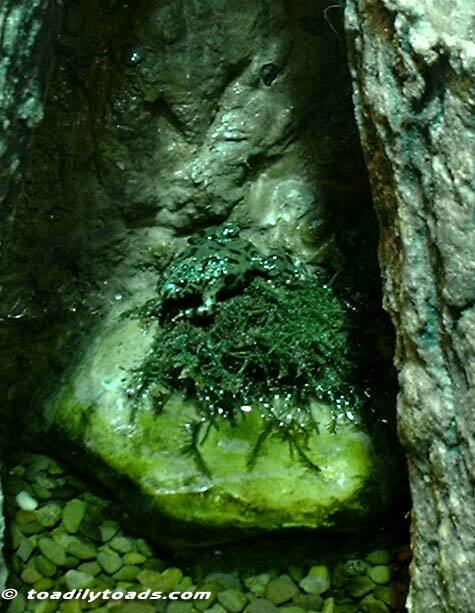 These guys, like all the amphibians in the exibit, are sitting on living, planted moss. Not the loose stuff in the bag that you can buy in the pet shop.